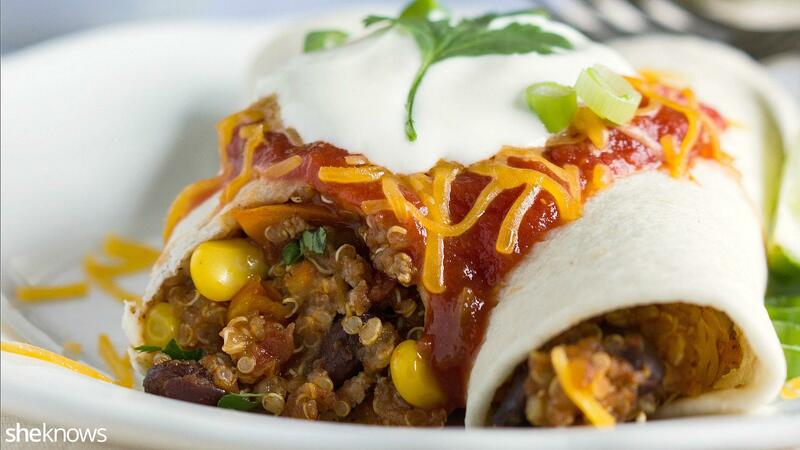 Quinoa is a healthy grain and one that is gaining popularity all over. It’s known for being relatively simple to make, but this meal will convince you just how simple it really is. 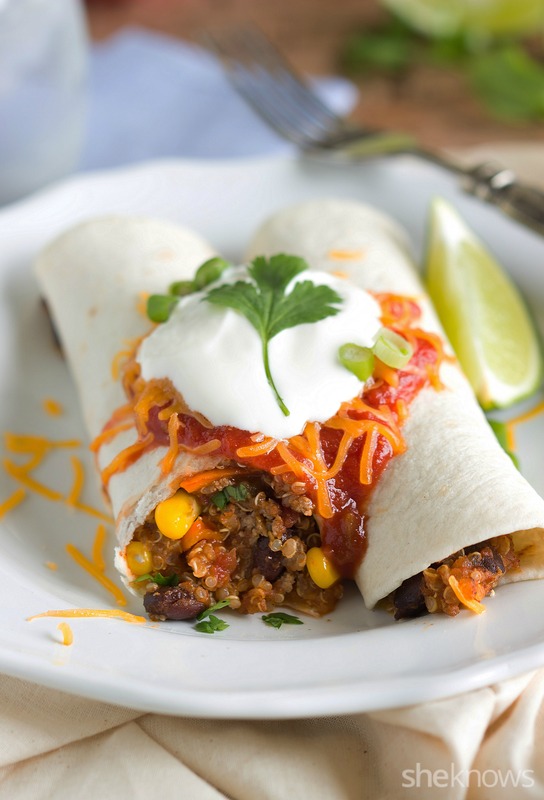 The quinoa and all the vegetables are prepared and cooked in the slow cooker, making for one easy and delicious meatless enchilada dinner. As it continues to get colder outside, cooking in my slow cooker is a must. It makes my whole home smell wonderful and has a very comforting feel to it. Lots of times meals made in the slow cooker are heavy or more comfort food based. However, this dish is comforting but not a heavy meal at all. It’s packed with vegetables and a good-for-you grain — quinoa. It’s also a vegetarian dish, but trust me, you will not miss the meat. If you aren’t a vegetarian and want to add some meat, then you need to cook the meat separately and add it to the finished mixture. I would suggest making chicken, but I’m sure other meats would do well with this flavor combination. You can also make this dish as spicy or as mild as you want. To make it spicier, use a hotter enchilada sauce and more seasonings. To make it more mild, use a less spicy enchilada sauce and fewer seasonings. It is definitely an adaptable meal as far as the flavors go. Feel free to substitute some of the vegetables for similar types of vegetables, as long as you keep the quantities about the same. Some other vegetable ideas include onions, different beans, green bell pepper, fresh tomatoes, chopped squash, peas or broccoli. 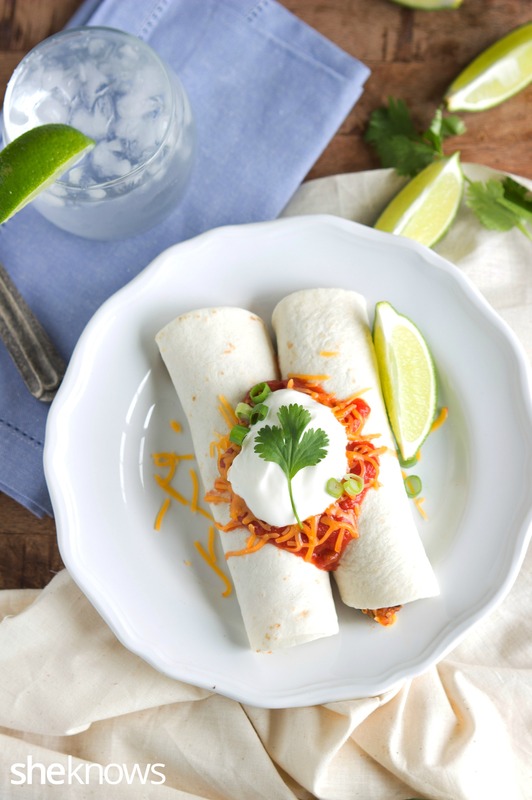 You won’t miss the meat in these hearty vegetarian quinoa enchiladas. And the best part is, the slow cooker does all the work for you for this easy meal. Generously spray a slow cooker. Add in the quinoa, black beans, corn, undrained tomatoes, enchilada sauce, chopped bell pepper and tomato broth. Stir together, and add in the enchilada spice mix. Cover with the lid, and cook on high for 2 to 3 hours or until all the liquid has evaporated. Evenly disperse the mixture among 8 tortillas. Top each tortilla with some cheese, and roll them up. The cheese will melt from the hot quinoa mixture. Top each enchilada with some salsa and some more cheese. If desired, top with sour cream, a lime wedge and some chopped green onions.